WOW air, Iceland's only budget airline, has taken the exciting and unusual step of asking the public to design its brand new planes. Valuable prizes are on offer to the winners - as well as pride to see their designs in the air. The Icelandic low-cost airline, WOW air has opened itself up to ideas from the general public. The question being: What should our brand new planes look like? WOW air has just taken delivery of a 2012 model Airbus A320 plane, which will allow it to keep providing the cheapest flights to Iceland - but now with an even bigger smile. The company has also announced, however, that it has three more new A320s on the way; and that is where the wannabe aircraft designer on the street comes in. Whether you are a professional designer or an amateur artist, there is no reason not to have a go at designing your own WOW air plane. Even if you don't submit the design it's going to be fun. And if you do submit, you could win free flights for two with WOW air for an entire year. Second and third place also win free flights. 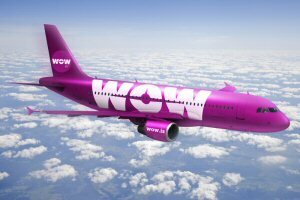 The WOW air website features a page with more details about the competition, including terms and conditions. The page also links to a useful blank template of a plain white A320. Feel free to use the plain plane as your aviation easel, your jet drawing board, your aerocanvas…you get the idea. The website is also the place to find out more about the company's logo, colour scheme and energetic corporate culture. The computer-shy will be pleased to note that entries can be submitted by post as well as by email - but hurry: the deadline is the 1st December. For more information on cheap flights to Iceland with WOW air, visit www.wowiceland.com. • WOW air was established in November 2011 by Icelandic serial entrepreneur Skuli Mogensen. Skuli has had a successful career building companies primarily in the telecom and technology sector in Iceland, Europe and North America. He was voted businessman of the year 2011 in Iceland. • WOW air aims to always offer the cheapest flights to and from Iceland. Through our many partners in Iceland and Europe we aim to offer our customers a complete travel experience from start to finish. • WOW air fleet consists of two Airbus A-320 aircrafts. The aircrafts are comfortably set up with 30-32 inch leg space. To view the photo associated with this press release, please visit the following link: http://www.marketwire.com/library/20121101-Airbus1.jpg.